You are welcome to receive a free 180-day evaluation key if you are a student or a professor. If you are a professor who wishes to use GenoPro as an educational tool, please send us a copy of your course syllabus by applying online. Upon approval, you and your students will be entitled to receive a free 180-day evaluation key. You will receive a unique identifier so your students can request their free academic evaluation key. If you are a student, feel free to inform your professor about this academic program. There is no cost for your teacher to apply for this program and you could use GenoPro for an entire academic term without spending a dime. To allow students to install GenoPro at home and use the product at no cost for an entire academic term. The GenoPro academic program enables students to use the full product, guilt-free. Everyone in the GenoPro staff has been a student once, and we are aware how expensive is education, and how difficult it is to make ends meet. Our philosophy is the following: if GenoPro has been useful to students during the classroom, then GenoPro may also be useful to those graduating students for professional work. We have many former students who purchased GenoPro upon finding a good job after graduating. The professor applies for the academic program and receives a Referrer ID. The professor does not need to purchase anything from GenoPro to receive a Referrer ID. At the beginning of each academic term, the professor gives his/her Referrer ID to the class. The student installs GenoPro on his/her computer, then enters the professor's Referrer ID while requesting the academic evaluation key. If the Referrer ID is valid, the student receives a 180-day evaluation key instead of the standard 14-day evaluation key. The simplest way to apply to the GenoPro academic program is by filling in the form. Pick a Referrer ID for you and your students. Most teachers use their login name and/or email address as the Referrer ID, as such Referrer ID is easier for everyone to remember. If you don't supply a referrer ID, GenoPro will use the first part of your email address until the @ (for example, the email address ProfPlum@Example.com would give the Referrer ID ProfPlum, and students may enter ProfPlum or ProfPlum@Example.com to receive their academic evaluation key). Upload your course syllabus. We use the course syllabus to better understand our users and therefore improve our product and services. For instance, we added about 20 toolbar buttons to create a medical genogram, the index person as well as the genogram legend. So far, we have received 3,300 valid syllabuses on the following topics: family system theory, therapy, counselling, sociology, psychology, anthropology, theology and Bible studies, nursing, career development, and various research projects. GenoPro reserves the right to decline your application if false information is sent. We welcome instructors from all over the world to apply to our academic program. I wanted to get back to you regarding GenoPro and let you know how effective it has been for me in both the classroom and in the therapy arena. Students have NO problem in using it and they are presenting beautiful personality genograms. I am really pleased with it. I also use it in teaching individual and group therapy, graduate students, and they also find it friendly. Again, thank you for being so generous with the program and updating it so regularly. tom. Thank You for Continued Use of a Great Product. I just wanted to thank you for the continued use of GenoPro. My graduate students get a lot out of the assignment that they do for my Grieving Family Systems Course. You are welcome to use the 180-day evaluation key on any computer at school, provided the school allows installing third party software such as GenoPro. If you wish purchase an Academic Site License for your faculty, GenoPro offers a super-discounted package for academic institutions. The Academic Site License is similar to this academic program, however the Academic Site License does not require a Referrer ID. The Academic Site License saves time to everyone when installing GenoPro, as the Academic Site License does not require any registration key, therefore no need to enter the email address, Referrer ID, wait for the email to arrive and enter the evaluation key in the Registration Wizard. If you purchase an Academic Site License, you no longer need a Referrer ID because there is no need to enter a registration key when installing GenoPro. Q: How long does it takes to get approved for the academic program? A: Less than two business days. The average delay is a few hours to receive a confirmation message. From the moment your Referrer ID is approved, your students may request their free academic evaluation key. Q: How long the academic Referrer ID remains valid? A: There is no expiration for the academic Referrer ID. A request for a free academic evaluation key expires in 180 days, however the Referrer ID is always valid. New students may request their academic evaluation key year after year. Q: Do I need to apply for each class? A: Of course not. You need to apply only once in your lifetime, unless you wish a different Referrer ID. We have professors who have been using their Referrer ID for more than 6 years and referred thousand of students. Q: Should I wait until the beginning of the semester to apply to the academic program? A: No. Applying for a referrer ID is different than requesting an academic evaluation key. Once you are approved, you receive an email with your referrer ID, however you need to enter your referrer ID in GenoPro to receive your academic evaluation key. The "timer" starts when you request an evaluation key. We give 180 days per academic evaluation key, so there is plenty of time for every student to complete their academic semester before the key expires. Every new student is entitled a new academic evaluation key. Q: Are there any restrictions on the academic program? A: No. 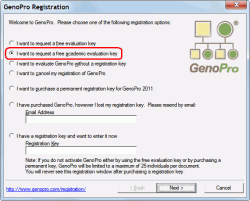 The academic evaluation key unlocks all the features of GenoPro.